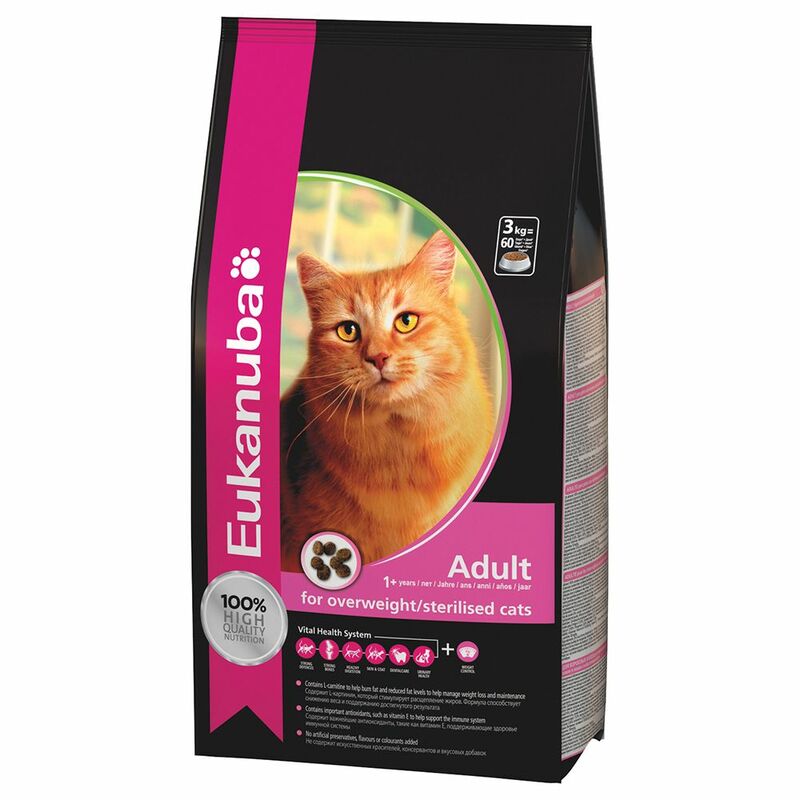 Eukanuba Sterilised/Weight Control Adult is 100% complete and perfectly formulated cat food that helps with losing exceΒ weight and keeping your cat to an ideal weight. The food is developed together with vets and is tailored to the specific needs of cats over a year old with a tendency towards weight gain. Reduced fat content and added L-carnitine help encourage the burning of fat and breaking down the body's fat deposits. Thus, Eukanuba Sterilised/Weight Control Adult helps with long-term weight reduction. The food contains 87% animal proteins out of the total protein content, which helps with the development and maintenance of sleep muscle. Added vitamin E provides antioxidants to support your cat's vitality and well-being. An optimal balance of omega 3 and 6 fatty acids can improve quality of skin and fur, giving your cat a wonderful glow. Eukanuba Sterilised/Weight Control Adult contains calcium and lots of healthy minerals to support healthy teeth and bones. Chewing the special kibble helps remove plaque and thus counteract tartar. This food contains no added artificial preservatives, colouring or flavouring. Eukanuba Sterilised/Weight Control Adult at a glance: Complete feed for overweight cats or cats that tend to put on weight over 1 year old For long-term weight reduction and to maintain an ideal weight 100% balanced and high quality: ideal for their specific needs Weight management: reduced fat content and L-carnitine to encourage the burning of fat and the breaking down of fat deposits 87% animal proteins: out of the total proteins for easy absorption, and development and maintenance of sleek muscle 38% meat: top quality chicken as a main ingredient Vitality: strengthens the immune system and the body's natural defences with healthy antioxidants from vitamin E Harmonious digestion: Prebiotics such as FOS and special dietary fibre can support intestinal health, and ensure a balanced intestinal flora. Sugar beet pulp can promote effective nutrient absorption Urinary tract: the low magnesium helps maintain a healthy urinary tract Skin and Fur: an optimal balance of omega 3 and 6 fatty acids for healthy skin and gloΒy fur Strong teeth and bones: important minerals, calcium and the shape of kibble all help to remove plaque Developed together with vets No artificial additives like preservatives, flavouring or colouring. Price just £18.99! Click here to buy now!